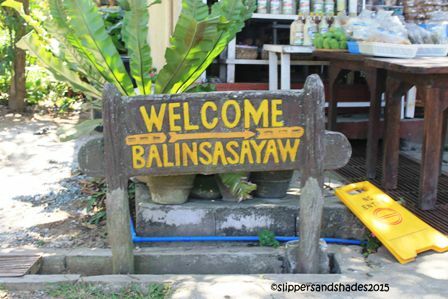 I’ve heard about Balinsasayaw Chicken Grill and Restaurant in Silang, Cavite from my office mate, a certified foodie who loves to eat unique food at unique restaurants. I relayed the story to my hubby excitedly. 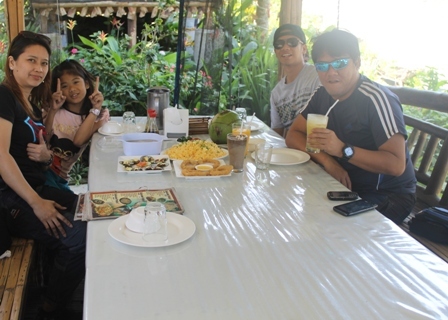 He promised me that we will eat in this resto with our kids once we visit Tagaytay. It was after our day hike at Taal Crater Lake in Talisay, Batangas when my hubby on the wheels surprisingly announced that our lunch will be at Balinsasayaw Restaurant. I got so excited because this is another unique dining experience for the whole family. And what’s more, we will skip the usual fast food chain’s faves of our two kids. Parking lot was almost full when we arrived. The security guard assisted us and right away he informed us that the resto was almost full because of on-going birthday party being held at the main function area. We were approached by a waiter and asked us if we are willing to share the last available unit with one family. Since we were all hungry, we agreed joining them. From the simple entrance, we were greeted by a beautiful landscape, with lots of plants, trees, flowers and several bahay kubos (hut made from native materials). The entire bahay kubo was covered with screen. This is to keep pesky flies and mosquitoes from getting inside and ruining customer’s mood while eating. 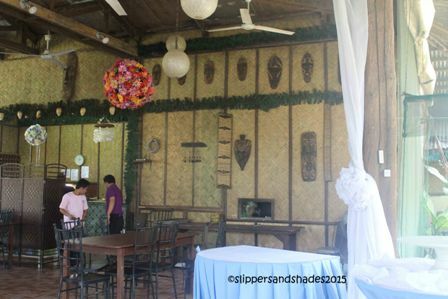 Inside the kubo, were long table, benches made of bamboo, wall fan and a buzzer to call the waiter’s attention. There was a white curtain that served as the division of the unit. Meaning, we have our privacy. We were given the menu, scrolled up and down, thinking what to order, if it’s the Packages A, B and C, the Bilao Packages 1, 2 and 3 or plainly a set menu. 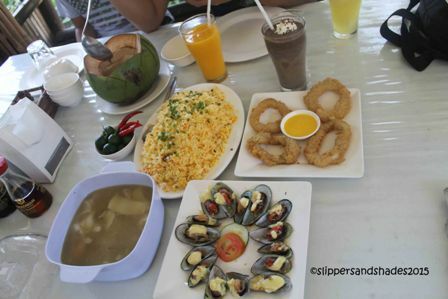 Well, we came to agree for our final choice, the set menu with Chicken Binakol (Iloilo’s version of tinola), baked scallop, calamares, Balinsasayaw rice and for our desert, special halo halo served inside a big coconut shell. And for the refreshments, pineapple juice for daddy, cookies and cream shake for Pao and ice tea for Shen. For me, I preferred water. While waiting for the food to be served, we enjoyed our usual trip, the picture-taking, talking, laughing and later, we embraced the serenity of the place. Seemed like we were in the middle of a rice field, relaxing and feeling the cozy ambiance of the place. No crowd, no noise. Indeed, it was so nice to sleep. Foods were served hot especially the Chicken Binakol with accompanying dipping sauce of soy sauce, calamansi and siling labuyo. We indulged our appetites and presto Pao and I were munching our favorite baked tahong. Binakol was so tasty. Calamares was four pieces only, we had it one by one. Balinsasayaw rice was so yummy too. Halo halo was superb. We really had full tummies afterwards. We stayed for few minutes after paying the bill. Daddy and Pao were so sleepy that they wanted to lay their backs on bamboo benches and sleep hahaha! Me and my daughter explored around. She was delighted to see flowers everywhere. She even played with the fountain near the main area. The time we went there, the b-day celebration had just ended. It was a peaceful lunch. The ambiance was very nice. Food was good. 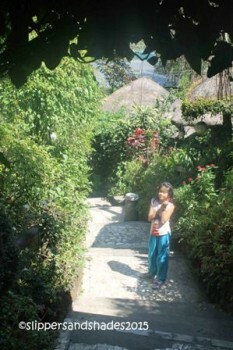 I sure want to go back once we visit again Tagaytay. Our total spending – Chicken Binakol – P325 / Calamares – 195 / Baked Scallop (Tahong) – P215 / Balinsasayaw Rice – P205 / Halo-halo Special – P135 / Pineapple Juice – P89 / Cookies and Cream Shake – P89 and Ice tea – P79, for a total of P1,332. Quite pricey? Be the judge. 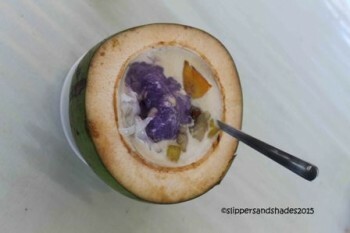 This entry was posted in Archive, Articles, Philippine Foods, Philippine Restaurants, Philippine Travel, Philippines and tagged Balinsasayaw Chicken Grill and Rerstaurant, Cavite, outdoor, Silang by shadesandslippers. Bookmark the permalink. Hi i,d like to ask how much is your wedding package the cheap one? Please call the restaurant – 046-8653244. Thanks for visiting my site. Hi! Ask q lng po f my reservation p or pde n dn walk- in any time? Wala naman po reservation kung mag dine in lang kayo. thanks for visiting my site.